The rumors were true - Nokia seized the global stage at Mobile World Congress this week to announce a new line of super affordable phones, including the Lumia 520. But one Nokia executive on the convention floor revealed that even cheaper Lumia devices are a possibility. Nokia's Hans Henrik Lund, Vice President of Smart Devices Marketing, spilled the beans to CNET. 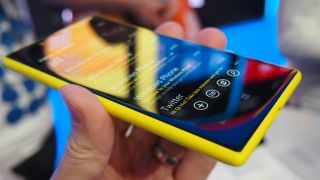 The Lumia 520 was announced at the start of MWC at a cool €139 (US$183, UK£121, AU$178) price point, but Lund reportedly said that's "not the lowest price point we can get to." With its onset of Windows Phone 8 smartphones like the Lumia 820 and Lumia 920, Nokia has been focusing on the high end of the price spectrum. But that changed on Monday when the Finnish phone company introduced the Lumia 520, Lumia 720, Nokia 105 and Nokia 301 to the world. Astute readers will notice the lack of a "Lumia" in those last two names, and that's because they're not part of the Lumia line at all - they're not even smartphones, in fact. Between the new Lumia devices and the ultra-cheap feature phones (the Nokia 105 is only €15 [US$20, UK£13, AU$19] and lasts a month on one charge), Nokia is trying to bring Windows Phone to the masses and put the fun back in feature phones. It's unclear from the statements reported by CNET exactly what Lund was referring to when he said that the price could go lower, but given the context and the site's other details it does seem he was referring to cheaper Lumia devices. Lund did explain that Nokia will likely stick with the multi-hued, polycarbonate motif for the time being. As far as future devices, he didn't offer anything concrete, but said, "We see our future in having a family including devices at all price points." That's certainly been evident in its MWC announcements so far.